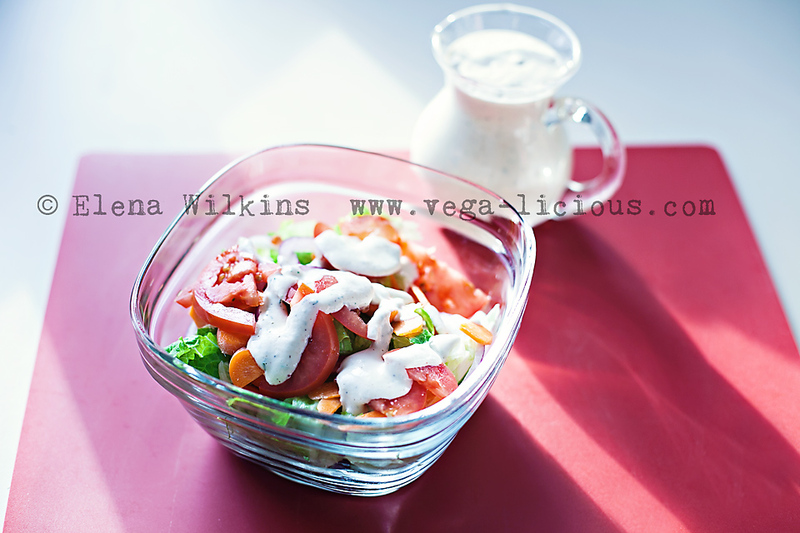 The cashew oil free ranch dressing recipe I shared last year was a hit. However, I have been itching to create even a lower fat option to enjoy. Fortunately for me, we recently shared a meal with a couple of friends and they brought a delightful tofu based dip to share that made me long for an oil and nut free ranch dressing even more. Two days ago I finally found a few minutes to get in the kitchen to create. My creative process involves either opening the fridge and staring at everything I got in it for a few minutes, or taking what I have and laying it out on the counter…and staring at it for a few minutes. A great low fat vegan Ranch dressing that will become favorite for all of your salads, and even baked fries. This homemade low fat vegan Ranch dressing should store well for over a week…that is if you or your kids don’t eat it before then. While it can be used on any green salad, Sprout loved dipping her bread and fingers into it (as did I). Try this ranch dressing recipe, let me know what you think of it and share it with as many people as you can!